In a time when people married for political and financial advantages, it was particularly unusual for a King to decide to marry for love. This is what it seemed Henry VIII was doing when he spent seven years replacing his faithful but barren wife Catherine of Aragon with the alluring Anne Boleyn. Although Henry claimed he was taking a new wife simply to get an heir for England, his subjects thought otherwise and assumed their monarch was marrying only to suit himself. Despite the opinions of the public, Henry did marry Anne. We all know how their relationship ends, although there is debate over who caused it and why, but were they truly in love? Was Henry, a man spoilt by his power and sycophantic courtiers, capable of real love? Or was he merely susceptible to infatuation? And was Anne simply a dedicated gold-digger marrying for ambition? Henry would always have a reason to be grateful to Anne, even after her death. During their struggle to remove Catherine and secure their marriage, Anne introduced Henry to several books that would forever alter the way he looked on his authority. She helped him to realise the true extent of his power and how to use it in their cause. Henry would have been well aware that not even his closest advisors had aided him as much as Anne had done in showing him the books. Consequently, it assured him that Anne was a trusted and loyal companion, someone he could rely upon. In other words, she showed qualities that would be admirable in a wife and queen. Insight into the way Henry treated the people he was closest to shows us that his affection often had to be earned. If somebody did something he liked, he often rewarded them with gifts or partiality. If they did things he did not approve of, he would become colder, almost reducing to childlike sulking. The royal way of life made Henry this way, encouraged by the fawning of his courtiers. As a result, throughout their relationship Anne was never more in Henry’s good graces than when she was helping him gain supremacy. From the beginning of their relationship, Anne fascinated Henry. She was a total opposite to the obedient and loyal Queen Catherine and the simple, pleasing ways of his two most important mistresses, Bessie Blount and Mary Boleyn. She was dark and alluring and, unlike many women of the time, could hold her own in a political or theological debate. She was more Henry’s equal than any other woman at court, not just a romantic interest but a friend and partner. During the seven years before their marriage, they were united as allies against all who opposed them, an endeavour that no doubt made them closer as a couple. Although it may seem an odd choice of subject to raise when trying to defend Henry’s love for Anne, the French swordsman is an interesting matter to consider. If Henry ordered the swordsman then the question is why. Although some historians believe that he used it as a bargaining tool, it is possible that it was simply a charitable gesture for a woman he had once deeply loved. He did not extend the same courtesy to his later wife Catherine Howard. This is possibly because he believed she was guilty whereas he knew the evidence against Anne to be false, or because he was never as much in love with her as he was with Anne. He also chose the comparatively more humane method of beheading over burning. It could be argued that he hired the French executioner out of respect for a crowned queen. However, he had treated Catherine of Aragon much worse and she was a blood princess of Spain. He was fully aware of her high status, as he remarked to Anne when he told her to endure his having a mistress as her ‘betters’ had done before her. There is no logical reason why he would treat Anne better than Catherine. He believed Anne was an adulteress and a witch. Or if he did not believe, he was aware that the evidence was constructed to get rid of her, as he and Thomas Cromwell required. In this case, it could be a guilty conscience that caused him to hire the swordsman, although it is debateable that he would have extended effort just for that. It is more likely that if he did feel guilt, he distracted himself from it in Jane Seymour’s company. It is highly probable that the evidence against Anne was false. She was far too intelligent not to realise the foolishness of cuckolding the King. If she did commit adultery it was probably because she was so desperate to become pregnant. Anne and Henry exchanged many love notes during their courtship. These included a series written in an illustrated Book of Hours that they passed between them in church. It would be nice to think that they were genuine, however given the trend for Courtly Love we can’t help but question their validity and relevance and wonder whether they were simply like all the other notes passed between courtiers; extravagant and only meant for show. Anne also used the Book of Hours as a tool to make a point; she wrote her famous loving couplet underneath an image of the Virgin Mary being told she was pregnant with a son. If we are to speculate that Anne’s ambition was the sole reason for her decision to marry Henry, we must take into account that she was from an ambitious family. Even if she did not court Henry for herself she could have easily done it at her father or uncle’s bidding. Yet if Anne did love Henry she would have had some degree of ambition to push for marriage and a coronation. She had very strong ideas about what to do with her power as Henry’s favourite, bringing about the Reformist changes, the favours for her family and her patronage of Hans Holbein the younger and the arts. It is also possible that Anne could have seen the potential that her sister Mary passed by. Throughout her years as Henry’s mistress, Mary never asked for anything. The Boleyns received some advantages nonetheless, but Anne could have realised that Henry might have been inclined to give more if it was requested in the right way. As she later demonstrated during the seven year wait, she knew precisely how to play him. It was a tactic that worked so well it would later be copied by Jane Seymour. Even if Anne was not overly ambitious, she would have been well aware of the fickleness of Henry’s love and for this reason may not have given her heart up. She had seen his affection pass from Catherine of Aragon to Mary Boleyn to herself within a relatively short period of time. She would have been wary of it passing on again sooner or later. She recognised Henry’s love of hunting and kept herself a prize out of reach for as long as she could. Henry’s well-known reputation for being a hunter provides additional verification for his feelings to be based on infatuation rather than love. He relished the sport of the chase and was inclined to lose interest once the prize was won. Although Anne was able to use this to her advantage in winning him, she eventually suffered the consequences of her own tactics. She enticed Henry by making promises and could not live up to them. She gave him a daughter, not a son. In allowing Henry to keep up the chase for so long, anticipation was unfortunately better than result. She also opened the door for other ambitious women and families such as the Seymours to step in and use her own methods against her. And by giving Henry the means to extend his divine powers, she also showed him how relatively easy it could be to rid himself of unwanted wives. 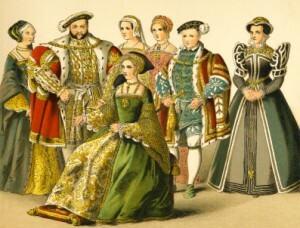 Henry’s previous relationships had all been somewhat short-lived, with the exception of his political marriage to Catherine of Aragon, but even through this he was known to stray. It seemed that he always became bored once a woman was caught. The rapid decline of Henry and Anne’s relationship after the long years spent developing it is the main defence against them being truly in love. Infatuation, which must have been part, if not all, of Henry’s feelings for Anne, is an intense but ultimately weak kind of affection. Their relationship was very passionate, both romantically and where tempers were concerned. Anne caused great passion in Henry throughout their relationship. Firstly through the long years of waiting, which resulted in many advancements for herself and her family, then through their arguments and their break up, which ended finally with her execution. With this in mind, and knowing that Henry was prone to impatience and unfaithfulness, it is perhaps surprising that he waited so many years for Anne. This is possibly more a compliment to her wit and entrancing personality than to Henry’s capacity for love. However, it shows that he had more depth of feeling for her than any of his previous or future partners. This does exclude Catherine of Aragon, who he waited a similar amount of time to marry following Prince Arthur’s death, but it is thought that although he claimed to be in love with her it was more for the sake of the Spanish alliance that he insisted upon marrying her. As for Anne, we must question whether it would have been possible for her to be involved with Henry for a decade and not feel something for him. Even if it was a love that developed slowly over time, or at the very least affection. We know that she was not satisfied to be his mistress, which suggests that she was not as head-over-heels in love with him as her sister Mary seemed to be, but this does not mean that she did not love him in her own way. The evidence, if it can be called that, for Anne being in love with Henry is scant. Aside from the similarities in their characters, such as their mutual appreciation for intelligent conversation, there is nothing other than speculation to suggest that they were in love. However, it could be argued that where feelings are concerned all evidence is speculation. We will never know for sure without the means to know Henry and Anne’s thoughts. As I have demonstrated here there are more reasons to be found for Anne to marry for ambition and Henry to marry for infatuation. It was, after all, a time when people died young and opportunities had to be seized with both hands. History has proved that Anne’s contemporaries would have taken any chance to portray her in a bad light, highlighting her flaws and exaggerating her ambitious qualities. They were also quick to say that Henry had been bewitched and enchanted and was never truly in love at all. But despite all this, theirs is a story that is written throughout history as one of the great tragic love stories. And in the end who is to say that they did not defy the odds and marry for love? Sorry, about the delay in answering but it was night-time here in Europe. Obviously Henry’s ‘Great Matter’, his quest to get his marriage to Catherine annulled so that he could marry Anne, led to him breaking with Rome and then you have Anne’s patronage of reformers, her influence which led to reformers being appointed posts within the church, her support of the Bible in English, her support of refugees etc. See https://www.theanneboleynfiles.com/4978/anne-boleyn-and-the-reformation/ for some discussion on this. Resources which may be useful to you: The Life and Death of Anne Boleyn by Eric Ives (book), Anne Boleyn and Reform – An article by Maria Dowling.